It feels great when your letter for leave has been approved. It always feels good to know that your boss or your HR Manager or your company has considered your problem and has sanctioned your leave application, despite the fact that you are needed in the office to manage your responsibilities. So it is a sweet gesture to write a thank you letter to the person who has approved your leave. While penning such a letter, you must make sure that your tone is soft and thankful but still professional. You must also mention that you are aware of your responsibilities at work and you have to take leave because of unavoidable circumstances at personal front. Make sure that you again explain your problem and assure that you will resume your work at the earliest. Here is an example format of letter for leave approval to help you have an idea about framing the letter in the best way possible. Refer to this template to create your customized letter. 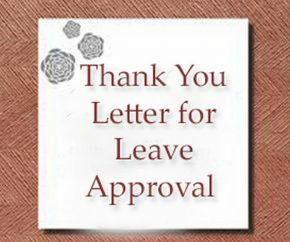 I am writing this letter in order to express my gratitude towards you for approving my leave. I am grateful for you for considering my situation and approving my leave application for two weeks. I have received your confirmation. I cannot express how important it is for me to be with my family at this point in time when my uncle is getting operated for cancer. And I really need to be there with my family to take care of all the medical arrangements and treatments. I shall resume back to my job at the earliest, once everything is under control. I will make sure that I am able to achieve all my targets and complete all my projects on time once I am back from my leave so that I can help our organization achieve its goals. I am extremely thankful to you for considering my problem and allowing me the leave for two weeks despite the workload at office.